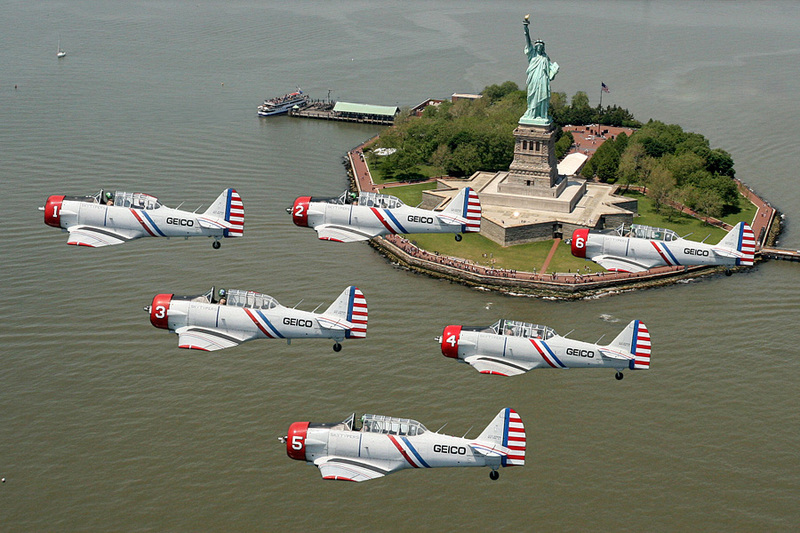 About the GEICO Skytypers. The GEICO Skytypers are the only flying unit in the world that performs at air shows typing their messages in the sky. For more information on the GEICO Skytypers, visit geicoskytypers.com. They can also be found on Facebook, Twitter and YouTube. To request more information or a 2012 Electronic Press Kit, please write or call the contact listed below. GEICO (Government Employees Insurance Company) is a member of the Berkshire Hathaway family of companies and is the third-largest private passenger auto insurer in the United States. GEICO handles auto insurance coverage for over 11 million private passenger auto policies and insures more than 17 million vehicles. In addition to auto insurance, GEICO offers customers insurance products for their motorcycles, all-terrain vehicles (ATVs), travel trailers and motorhomes (RVs). Coverage for life, boats, homes and apartments is available through the GEICO Insurance Agency. Commercial auto insurance and personal umbrella protection are also available. As a member of the Berkshire Hathaway group of companies, GEICO is rated A++ for financial strength by A.M. Best Company and ranks at the top of several national customer satisfaction surveys. For more information, go to http://www.geico.com.